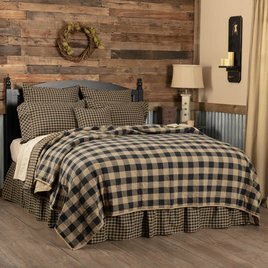 The handsome, pleated Black Check Bed Skirt by VHC Brands boasts a black and tan check pattern. This cotton bed is backed in a white cotton backing and is machine washable. Choose from available size options. See options below. Size: * Twin 39"x76"x16" Queen 60"x80"x16" King 78"x80"x16"
Twin: 39W x 76L in. ; Drop: 16 in. in. Queen: 60W x 80L in. ; Drop: 16 in. in. King: 78W x 80L in. ; Drop: 16 in. in. 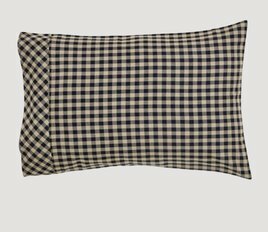 See our Black Check Collection. Thank you for choosing to shop with us and considering this Black Check Bed Skirt! The Black Check Scalloped Swag Set, 2 pieces, has a black and khaki traditional check. These swags are 100% cotton fabric and come lined. Scalloped hem. The swags have a 3.25" rod pocket and a 2” header, which is included in overall measurements. 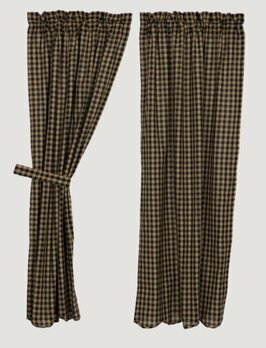 Black and khaki checks are blended with faded texture at points of intersection to give a modern facelift to the classic pattern on the Black Check Scalloped Prairie Curtain Set. 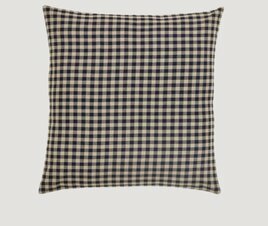 Coordinates also with Farmhouse Star & Black Check Star Collections. 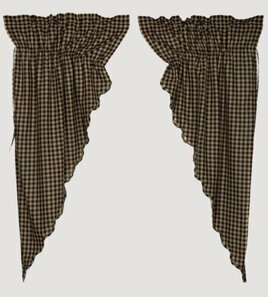 Drape your home in a classic, country style with the VHC Brands Check Balloon Valance. 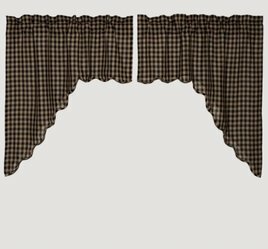 This 15" long x 60" wide balloon valance features a rod pocket detail at the top for easy hanging and is made of 100% cotton for simple care. The Black Check Scalloped Panel Set of 2 is a classic touch. 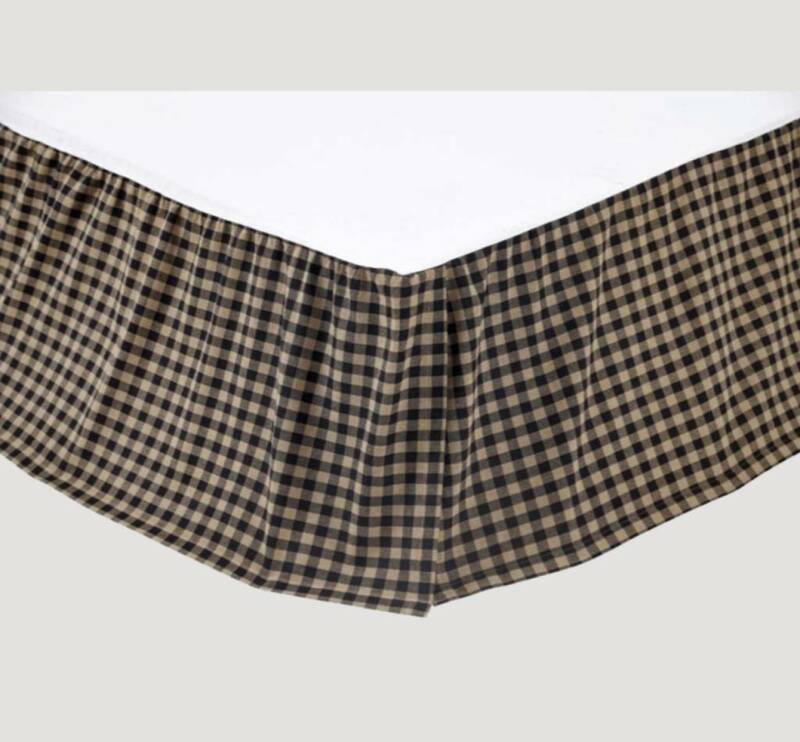 Made of a single fabric; Machine stitched; Small scale black & khaki check fabric; Lined with white cotton; Scalloped edge; Features 2″ header & 3.25″ rod pocket; Includes 2 matching tie backs. 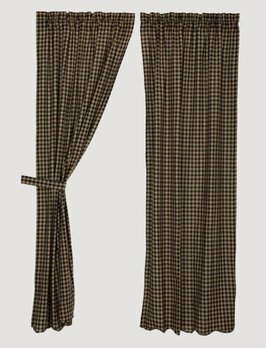 The Black Check Scalloped Short Panel Set of 2 is a made of a single fabric; Machine stitched; Small scale black & khaki check fabric; Lined with white cotton; Scalloped edge; Features 2″ header & 3.25″ rod pocket; Includes 2 matching tie backs.